It reminds me of an epiphany I had last year while raking leaves along the back property’s edge. Last year’s landscaping activities have taken a toll on the property. 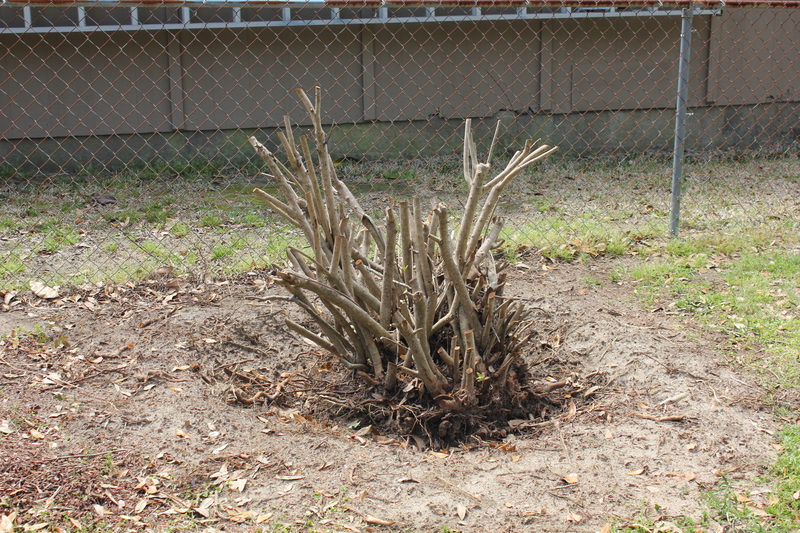 In the spring of 2013 I hired someone to remove all the ancient bushes from around the house, as well as rip out the bush’s stumps and roots, unfortunately leaving behind the hardy weeds. The Sago Palms around the property (which I learned are toxic to dogs) were moved to the front yard. Until the wood trim on the brick house is repainted and new gutters are installed, sometime this summer, the house presents a vacant, possibly foreclosed appearance. It weighs heavily on my conscience. Like me, the house appears past its prime, wrinkled, peeling, in need of a face lift. I remind myself to stay on task with my five-year plan, which is to gradually instill new life into this house where my parents lived for over thirty years. In the back yard the detritus from the construction of my dog training building is also a reminder that there too I have a backlog of landscaping chores. Each day I tackle some small project. It reminds me of an epiphany I had last year while raking leaves along the back property’s edge. Each day I completed one small area, the dog’s running around me, relishing the fresh air, tearing through the leaves as fast as I raked them into a neat pile. Eventually that length of the yard, bordering the neighbor’s woods, was immaculate and I felt a wave of accomplishment, even though the rest of the two acres cried for attention. I realized that small accomplishments every day lead to the completion of big tasks. Nothing is too big, no job too overwhelming. Take on one piece of the job at a time and stay focused but allow myself a pat on the back at the end of each day. This epiphany has helped me in other aspects of my life. Each day when I train my dogs or work on my crafts, I remind myself that every small step I take leads to the completion of a final goal, thus a reminder never to give up. While walking with the dogs in the back yard this spring, I made the decision to remove what I call the “Gathering Bush”. It is an unknown variety of bush that flowers each spring but needs constant trimming, made difficult because of the thorny weeds woven intricately around it. The bush is positioned next to the fence where the neighbor and my mother used to meet and discuss their problems or just laugh about life’s foibles. Should I now keep the bush or in mom’s memory plant something new? I have opted to eventually hire someone to plant two flowering Dogwood trees in that location. But first remains the task of removing the overgrown bush, which has grown taller than my 5’4”. I rallied the dogs into the back yard to “help” me and in two days the bush was cut down to only a huge stump. Which brings me to my next overwhelming problem, how to remove the stump and its roots. Clearly the roots are tied to a building on the other side of the world because they are not budging. My muscles feel useless. I brought out my favorite tool from the nearby garage, the mattock, which usually makes me feel strong and invincible. But in this case it is almost useless. These roots refuse to budge and are going down and out in ten different directions, cut one and another appears next to it. Finally one day I was able to dislodge one corner of the stump. It is a small victory but one loosened corner leads to another until finally the stump will be gone. I’m not there yet. This may take a month or two but in the end it is my battle, my small victory every day. When the trees are finally planted I can tell my mom in heaven that I did this for her. She would love the blossoms and Florida’s beautiful birds that it will attract. In the future the neighbor and I will have a new gathering spot, talking about things we women traditionally share. This entry was posted in life goals, Mom, Retirement Life and tagged Dog, Florida, retired life. Bookmark the permalink.